Relay for Life is a 12-hour walk to raise awareness for cancer and to honor those who have survived the disease. 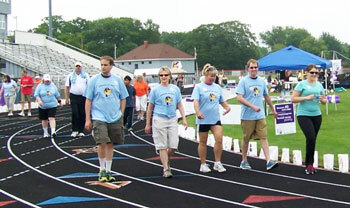 A Mini Relay for Life involving school children grades 3-5 takes place in late May at Oriole Field. About 800 youth from area schools usually participate. 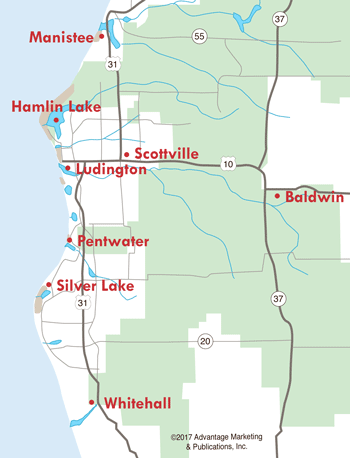 Pledges are taken and participants walk the track around Ludington's Oriole Field Saturday from noon to midnight. The Opening & Survivor Ceremony/ Lap is at 12noon. A Survivor Luncheon is at 12:30pm and Team Lap begins. At 9pm, luminaries are lit and placed around the oval, representing those touched by cancer and honoring ones who lost their battle. The Closing Ceremony & Pizza Party is at 11:45pm. In 2018, other activities on Saturday include a Silent Auction, Mascot Challenge, kids laps including Bucket Brigade, music by the Mason County Central Jazz Band, a local worship team and Joey Mankus, Kibby Creek Campground Kids Train, Home Depot Building Station, and Inflatables. In 2017, teams and sponsors raised almost $58,000 toward the fight against cancer. In Mason County alone, the Road to Recovery program was started to get patients the much needed transportation for cancer treatment. To date, this program has logged over 26,000 patient miles. In addition, $15.4 million in research grants is currently at work in Michigan, with $1.4 million at the Van Andel Institute of Grand Rapids. If you or a loved one have dealt with cancer, Relay for Life is a way to fight back, and your help is needed. Participate by walking, or give monetarily. The American Cancer Society is dedicated to early detection and education, to helping people get well through services and programs, and to continuing the search for a cure. For more information on how you can join the Mason County Relay for Life, call Taylor Chrisman at (231) 690-2287, or email her at taylorchrisman@cancer.org.